The match between Germany and Ghana finished in a 2-2 thriller. Veteran striker Miroslav Klose had to come off the bench to save Germany from in their World Cup Group G match. With a close range shot, Klose now has 15 career World Cup goals, equaling the mark set by former Brazil star Ronaldo. Earlier, Mario Goetze had put Germany ahead in the 51st, but Ghana equalized three minutes later through Andre Ayew. Ghana captain Asamoah Gyan then put the Africans ahead in the 63rd, and the Ghanians celebrated. But Klose later came on to rescue Germany and tie a World Cup record. Mario Gotze opened scoring in the 51th minute for Germany. Three minutes later, Andre Ayew equalized for Ghana. Asamoah Gyan put Ghana ahead in the 63rd minute with a right footed shot towards the right near post. 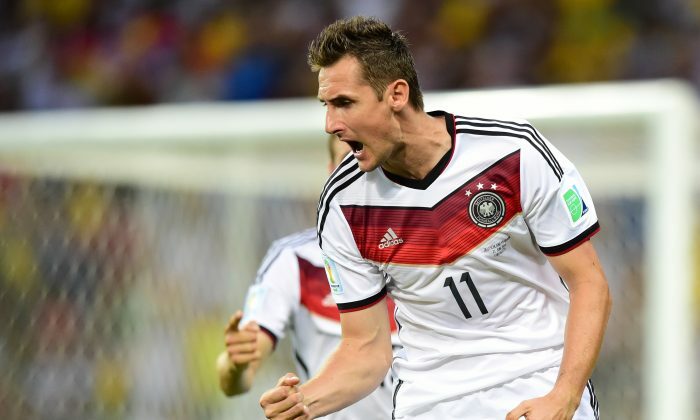 Finally, Miroslav Klose scored his record breaking 15th World Cup goal in the 71th minute. Klose fired a right footed shot from very close range to the bottom right corner of the goal to equalize for Germany. Here is an Associated Press article on Saturday’s World Cup 2014 matches. RIO DE JANEIRO (AP) — Argentina will be looking to seal its place in the knockout stages of the World Cup with a match to spare when Lionel Messi and his teammates face Iran on Saturday. The Iranians are bound to make life difficult for one of the tournament favorites, as they did for Nigeria in a gritty 0-0 draw. But Messi’s superb winner against Bosnia-Herzegovina was a reminder why he has been voted world player of the year four times. Germany, which opened with a 4-0 demolition of Portugal, can take a giant stride toward the last 16 when it takes on a Ghana side that slipped to a late 2-1 defeat by the United States. The last game of the day pitches Nigeria against the Bosnians. Pay attention to Argentina’s formation, it may just be the start of a rift between coach Alejandro Sabella and his captain Lionel Messi. Sabella used a 5-3-2 formation for the first half of Argentina’s opening game in Group F, before switching to the 4-3-3 lineup which Messi prefers. Messi, who later made a thinly-veiled criticism of Sabella’s initial tactics, went on to score a superb goal after the break that proved to be the winner. The first few minutes against Iran should reveal who’s won the tactical argument for this match. For his part, Iran’s Portuguese coach Carlos Queiroz certainly hasn’t downplayed the stakes on Saturday. However, he meant it more as a warning, than a comment on popular opinion. And at a tournament where world champion Spain and England are being sent home early, and Italy has been outclassed by Costa Rica, it may not be an empty threat. Venue: Belo Horizonte. 1 p.m. local time (noon in New York, 5 p.m. in London, 1 a.m. in Tokyo). A win for Germany, and a victory or draw for Jurgen Klinsmann’s United States team the following day against Portugal, will guarantee early qualification from Group G.
However, the challenge for Joachim Loew’s side will be as much mental as physical. Like Italy, which lost 1-0 to Costa Rica on Friday, Germany has suffered from “second match syndrome” at recent tournaments — losing to Croatia at Euro 2008 and Serbia at the 2010 World Cup. Loewe says it’s “a psychological problem” for teams to keep concentrating after achieving a good start, and it could strike his team on Saturday. Meanwhile, Germany’s coach is sweating on the fitness of central defender Mats Hummels, who is nursing an injured right thigh. His absence could see Jerome Boateng move from right back into the middle, or the deployment of Shkodran Mustafi. Ghana has had to cope with more than just the disappointment of losing its opener 2-1 to the U.S., a team it had knocked out of the last two World Cups. Ghana’s Football Association has had to deny reports of a player revolt against coach Kwesi Appiah. A Ghanaian radio station claimed that players were unhappy with Appiah’s tactics. Though it’s hardly an ideal preparation for the game, Loew doesn’t expect Ghana’s players to make it easy for the former world champions. “They will fight until they bleed,” he said. Venue: Fortaleza. 4 p.m. local time (3 p.m. in New York, 8 p.m. in London, 4 a.m. in Tokyo). IN MEMORY OF THOSE WHO DIED Nigeria’s opening 0-0 draw has left the African side with plenty of work to reach the knockout stages, but the team coached by Stephen Keshi has a far greater motivation for victory over Bosnia-Herzegovina. Changes are expected in the lineup, with a possible start for striker Peter Odemwingie up front alongside Emmanuel Emenike. Bosnia was a match for Argentina for large parts of its opening game in Group F and coach Safet Susic believes his team can do even better against the Nigerians. “We haven’t shown everything we are capable of yet,” Susic said.